We have come to the height of summer, and there are some days when we just feel like staying in to hide from the heat. Watching dramas is one of the best way to spend your time. Besides accompany the stunning visual palettes and actions, soundtracks play an essential role of orchestrating the mood and conveying the characters’ emotions. In this week’s accompanying story to KKBOX’s Music Supper, co-presented by Bandwagon, we pick three Mandopop soundtracks from dramas and movies to tune in to this month. Check out the full video of this week's KKBOX's Music Supper here. After her recent win at the 29th Golden Melody Awards as Best Mandarin Female Singer, Lala Hsu graced us with her hauntingly melodious voice in 'Love Hard To Wish For', the ending theme song for Zhejiang TV’s Legend of Fuyao. Starring Yang Mi and Ethan Juan, the fantasy period drama tells the tale of Meng Fu Yao, a young female warrior on her mission to collect secret orders from the five Kingdoms with the Crown Prince. The song, which is Lala Hsu’s first piece of work after her Golden Melody Award win, justifies that Lala was worthy of her win. 'Love Hard To Wish For' shot up KKBOX’s weekly charts, landing itself in the third place within one week of its release. After her last hit 'Light Years Away', which is the theme song for movie Passengers, GEM returns with yet another crowd-pleasing soundtrack. 'Ethereal Love' is the theme song for Chinese movie Asura, believed to be China’s most expensive production ever. The million-dollar fantasy film is based on the Buddhist mythological realm of pure desire, Asura, being threatened by a coup from a lower heavenly kingdom and stars rising Chinese actor Wu Lei and Zhang Yi Shang, as well as Hong Kong’s Carina Lau. With GEM’s soulful voice, its atmospheric arrangement and dreamy lyrics, 'Ethereal Love' paints a picture of an all-encompassing universe. The song rose quickly up the charts, from the 98th place last week to the 6th place this week. Dino Lee, who shot to fame playing high school heart-throb Ouyang Fei-fan in Taiwanese film Our Times, is stealing hearts once again with his latest album Sing With Me. 'Fragile', from the same album, is the ending theme song for the Taiwanese release of Korean drama Live Up To Your Name. The drama, starring Kim Nam-gil and Kim Ah-joong, is a time travel drama discussing the difference between doctors in the 17th and 21st century. Most of us have seen Dino’s acting in Our Times, but have little knowledge of his musical background. Dino studied music at Musicians Institute in California and Sing With Me is his third self-composed album. 'Sing With Me', the title track, is also the opening soundtrack for Live Up To Your Name. 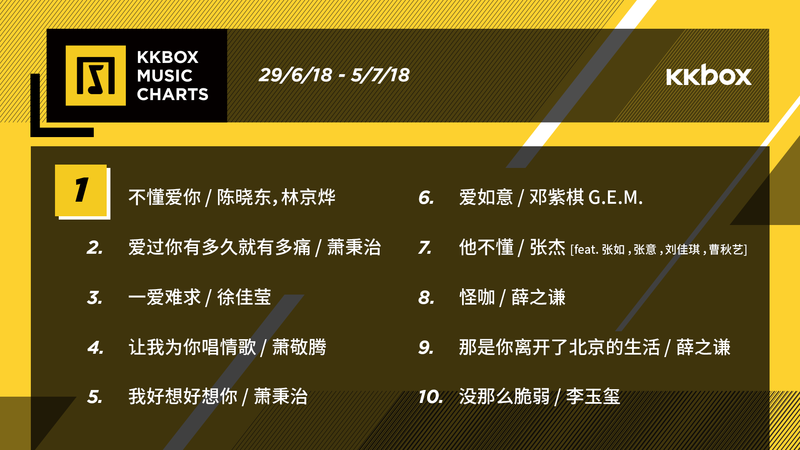 Dino is gaining ground in the Mandopop scene with his music, with 'Fragile' standing firm in KKBOX’s weekly chart for the second week running. Watch highlights of this part week’s KKBOX Music Supper, hosted by StellaVee with special guest Hubert Ng, below! Catch the next episode this Thursday at 8pm on KKBOX’s Facebook page.